Before you know it, the holidays will be here. There’s still time to gain more customers before the frenzy begins, though. By using rack cards, you can get more attention that you’ve had. The secret is knowing how to do it well. Read on to find out how these cards can boost your business just in time for the holiday rush. Although rack cards are highly similar to postcards and business cards, they’re also different in several ways. For one thing, you can include much more information to educate your customers about what you can do for them. You can spotlight brand new products or the latest deals that can let your customers save more money than if they choose to purchase anything from your competition. Even repeat customers stand to learn something new, which is always a good thing. Plus, compared to other marketing materials, rack cards are relatively inexpensive, allowing you to save some money. 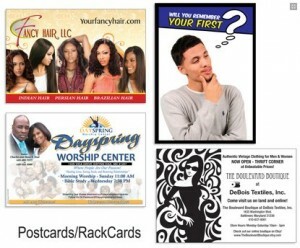 Since rack cards can save you money, you can put some of those savings towards other elements of your business. Create higher quality printed materials, such as brochures, door hangers, and flyers. You can also continue to advertise your business while getting plenty of money back from the increased visibility you gain through such efforts. That said, you need to make sure that the text and graphics you use are all crisp and beautiful. You need to think long and hard about the design of your rack cards. After all, you want to make a good first impression on customers who might not have heard of your business before. Make sure none of the photos are pixelated or washed out, and think about the colors you use to make sure that they complement each other. At the very least, they should stand out while being visually appealing. Research the designs that other businesses in your area or your industry use to get a better understanding of how to reach your customer base. Rack cards are only 4” x 9” so you don’t have much room to tell your story. One last suggestion when it comes to rack cards is that you need to find clever ways to distribute them. Deliver some to local libraries and community centers along with malls and grocery stores. Then think about business expos, industry conventions, winter concerts, and sporting events – all of them present exciting opportunities for you to attract new customers! Whether you know already how your rack cards should look or you want further advice, Time Printers is here to help. We service all of Baltimore, Hunt Valley, and Towson. Our team of professionals can tackle all of your questions. Give us a call at 410-566-3005 and be sure to follow us on Facebook, Twitter, Google+, Pinterest, and LinkedIn for tips and to see what we have been working on and what we can do for you. This entry was posted on Friday, November 16th, 2018 at 12:27 pm	and is filed under Rack Cards. You can follow any responses to this entry through the RSS 2.0 feed. Both comments and pings are currently closed.